A few months ago, suffering from a terrible bout of jetlag, I decided to sort and rearrange my cookbook collection. I purposely avoided counting them (some things just don’t need to be known) but let’s just say I have a lot. In the course of sorting, I found quite a few I haven’t cracked in years and were happy reintroductions, others left me perplexed as to why I had them and yet others made me laugh out loud. 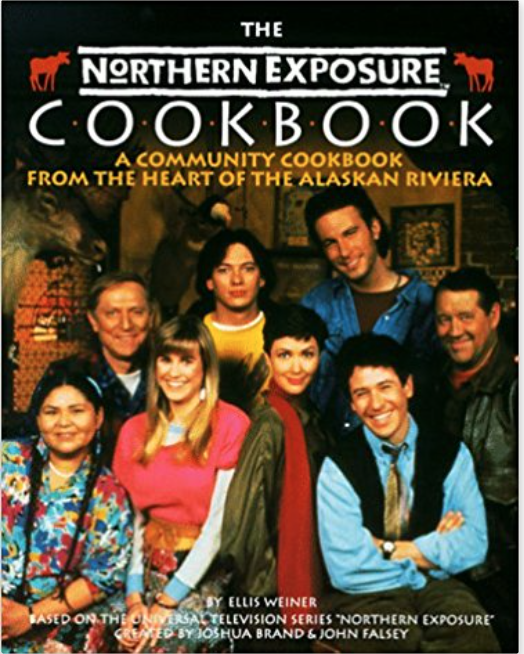 One of the later was The Northern Exposure Cookbook: A Community Cookbook From the Heart of the Alaskan Riviera. I’m sure it was a gift though I don’t recall from who. I loved that 90’s show about small town Cicely, Alaska and all the characters that lived there. Plus DJ Chris Stevens was hot. (When has John Corbett not been hot?) While the DVDs are readily available, the show doesn’t seem to be streaming anywhere. That’s a shame. There’s nothing really groundbreaking here in terms of the recipes, mostly classic comfort food but they’re usually from a particular episode (food was a big focus on the show) or from a specific character and the recipe headnotes from the character perspective are rather delightful. There are fancy things from Maurice Minniefield, overly involved recipes from Adam, comfy recipes from Ruth-Anne and Marilyn and numerous recipes from Shelley Tambo and Holling Vincoeur’s tavern “The Brick”. Everyone is represented and it’s kind of awesome. Reading back through the book after all these years was kind of fun. I couldn’t recall cooking anything from this book but there was one page marked with a post-it. I flipped to it … Chicken Wings. Ah yes, I remember! A simple marinade/glaze of soy sauce, honey and mustard powder, they were easy, sticky, delicious and I remembered eating a bunch of them during a certain period of my life. I haven’t had a Chicken Wing Friday in quite a while and seeing as it’s the first day of June AND a Friday, it seemed like the perfect thing. The marinade is easy – four basic ingredients – then it’s later reduced to a thick, sticky glaze while the wings are baking. They’re not fancy and there’s nothing really complex about the flavor but they’re really good, the kind you serve with a roll of paper towels to wipe off messy fingers. I added a little bit of chili paste (sambal olek) for a kick but you don’t have to. 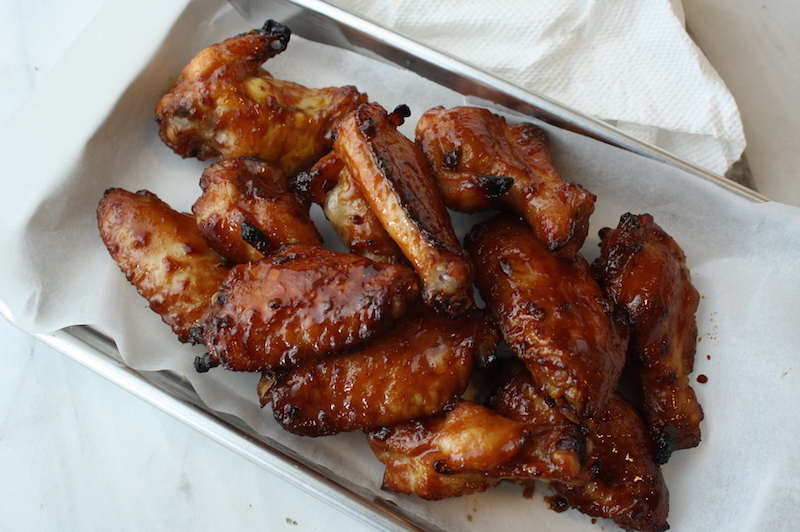 The only thing you really need to do is reduce that marinade to a nice thick glaze so it coats the wings really well. And don’t burn them. OK, that’s two things. You can handle it. STRESS THERAPY BAKING FACTOR: FINGER LICKING GOOD. Eat a bunch of these with a cold beer and pretend you’re at The Brick. Flipping through this book gave me some happy memories from a time when if you weren’t home to catch a show, you had to remember to set the VHS recorder. Shows weren’t streaming or on demand or available 24 hours a day. You had to plan. And you had to rewind. Taping over someone else’s unwatched shows was a traumatic event that usually ended in a lot of screaming. Television programs were appointment TV. Imagine that in this day and age. I think we may have been better for it. 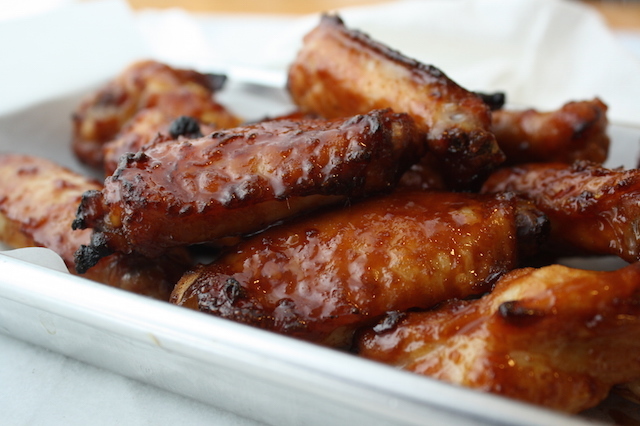 So I’m a little persnickety in how I like to bake my wings with a glaze. I start these right side up for 10 minutes. Then I flip and bake 10 minutes more. Then I glaze and bake (no flip) for a few minutes until the glaze sets, then I flip (now right side up), glaze and bake for a few minutes, watching closely so they caramelize but don’t burn. Oh. And I rotate the pan each time too. You do you. to marinate: In a large heavy duty ziplock bag combine all the marinade ingredients. Add the chicken wings, seal and turn over a few times to fully coat. Preheat the oven to 375°F with a rack in the middle. bake: Line a sheet pan with foil and insert a wire rack into the pan. Remove the wings from the marinade and place on the wire rack. Bake for 20 minutes until crisp and golden, turning halfway through. for the glaze: Meanwhile, pour the marinade into a small saucepan and reduce, over low heat, until very thick and syrupy. Depending on the pan size, this could go quickly or take a while so keep an eye one it. 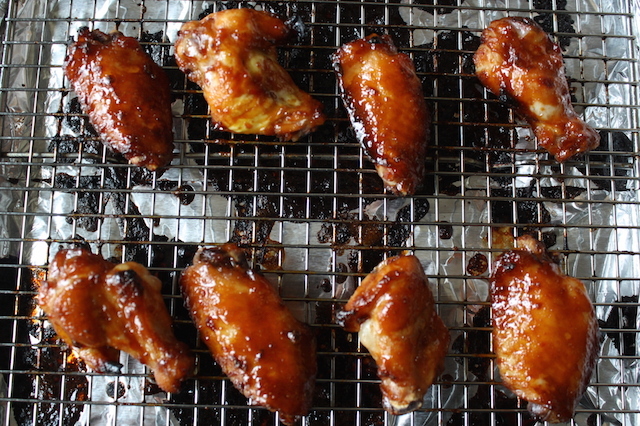 Remove the wings from the oven and baste with the sticky sauce. Turn the wings, brush with the remaining sticky sauce and bake for another 4-5 minutes until dark golden brown and sticky. Keep an eye on them as the sauce will burn quickly. Serve hot or room temperature with a ton of napkins or paper towels.